During the summer of 2018 six visual artists, one writer, one performance artist and one gardener lived and worked together at Rolling Acres Farm in Jefferson, Maine. 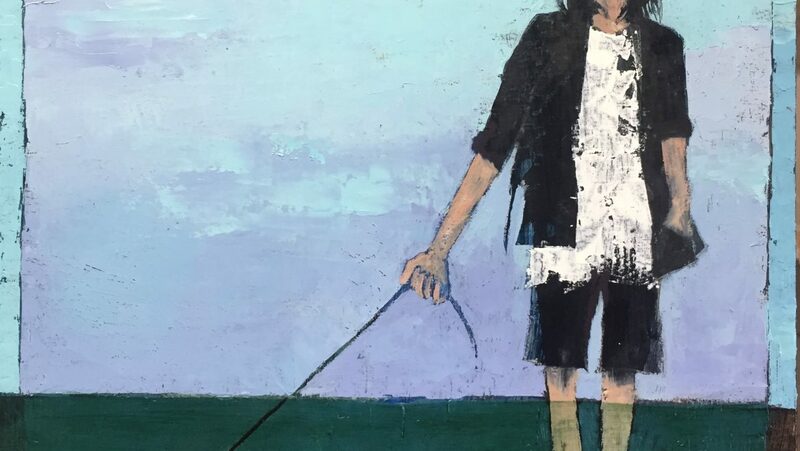 All had been selected for the MFT’s Fiore Art Center residency program, because of the common thread running through their work: a meaningful engagement with themes related to agriculture or the environment. The solitude, natural setting and communal aspect of the residency allowed the artists to focus, explore and create in new ways. 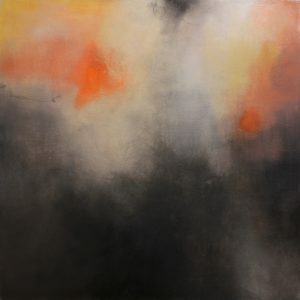 The exhibit of the work produced during their residency is a fabulous exploration of color, atmosphere, and connection to the natural environment. The 2018 Fiore Residents Exhibit opened March 18 and will be on display until May 24th. It concludes with artist talks at 5pm and a closing reception from 5:30-8pm at the MFT Gallery in Belfast. 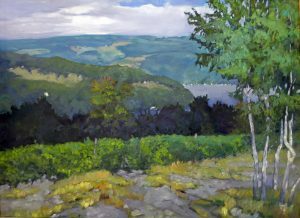 Carol L. Douglas created her vivid plein air landscape paintings “Blueberry Barrens, Clary Hill” and “Blueberry Barrens, WC” in oils and watercolors respectively, investigating the confluence of paired painting to see if the fresh mark-making that occurred in her watercolors on Yupo would translate to her more familiar oil paintings. 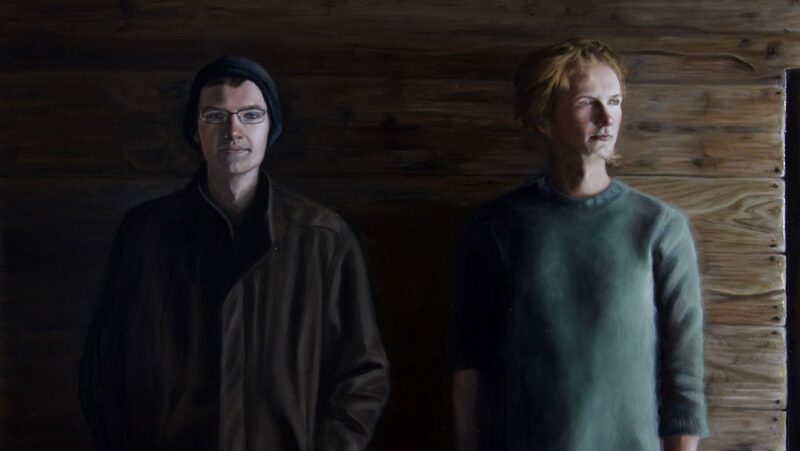 Maxwell Nolin took advantage of the uninterrupted time in the studio to work on two large, luminous oil paintings, “Self-Portrait, 2018” and “Tea,” which enabled him to slow down and reflect on the conceptual aspects of his work, as well as explore different experimental techniques with his process. In addition to working on her narrative manuscript, writer-in-residence Jodi Paloni produced a beautiful lyrical writing called “Rain Begins the Day,” which captures the essence of the farm landscape and the connection felt by all who were taken in and nurtured by it. Clif Travers spent time exploring the natural environment of the field and woods and connecting with the community at the farm. In the studio, he constructed an 8 x 6 foot sculptural panel using discarded lumber and other wood products, in an attempt to honor and reconstruct the beauty of trees. Travers then painted the three-dimensional panel in a style referencing church mosaics and stained-glass windows. He contributed a print of the stunning “I Dream of Trees” for this exhibit. During her residency, Stephanie Mercedes continued building archives of missing violent histories and created a variation of her “Relicarios” installation. Mercedes’ work honors the grandmothers who protested the disappearance of their children by wearing lockets. Her work on display includes research on those that escaped political persecution in Argentina and relocated to Maine, drawings, and a lighted locket. Thu Kim Vu, from Vietnam, was inspired by the personal bonds formed during the residency through the communal kitchen, food, and the garden. She created a wonderful series of miniature paper drawings of pots, pans, and utensils glued on several overlapping sheets of Plexiglas that are designed to be viewed through the natural light of a window. In addition to growing unusual vegetables and ornamental food for the residents, the resident gardener Rachel Alexandrou created a video installation called “The Nature of Stewardship”. This was inspired by her work in the garden and kitchen and explores the relationship between human, body and earth. Artists featured in our current exhibit, HOMELAND, will give talks that will coincide with the Belfast Holiday Art Walk on Friday, December 7th at 5pm, with a reception following from 5:30-8pm. HOMELAND will be up in our Belfast Gallery from November 12th, 2018 through March 1st, 2019. For more information on the show, read here. MFT Gallery’s new show, I Went To the Animal Fair: Finding Common Ground, features Belfast artist Kerstin Engman’s oil paintings on the first floor, with works by Andre Benoit, Frances Hynes, Leslie Moore, and Julie Cyr on the second floor. Kerstin’s works for this show are inspired by the animals, goods, and people at the Common Ground Fair Country Fair. To create her signature style, she applies paint in layers of darks, lights, and color to add texture and depth to the pieces. 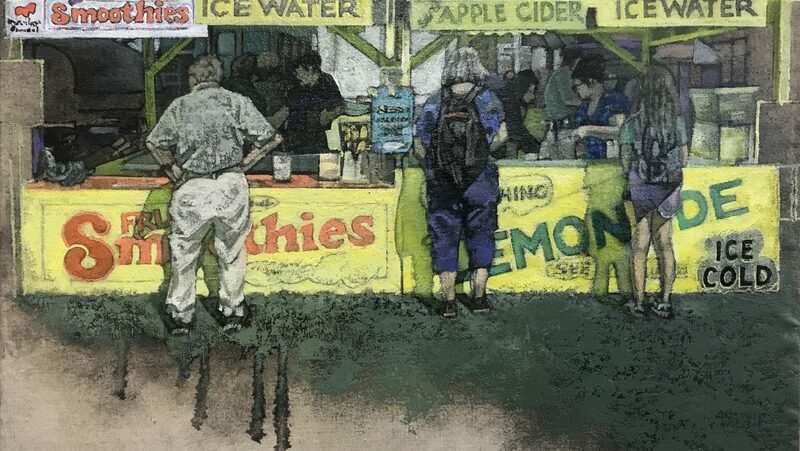 For some of her pieces she uses stencils and modeling paste to create non-representational patterns that form the texture of backgrounds and individual parts of the painting. “Specific design elements and color are the foundation of my recent studies, incorporating repetition, swaths of color, grids, dots, angles, shapes, and overlaps,” Kerstin said of her work. The quintessential paintings depict handsome roosters in their grid-like wire cages and sheep and cows in darkened stalls with light streaming in through windows. Gourds and other vegetables with beautiful cast shadows, skeins of dyed yarn and bundles of lavender, and the fair-goers under tents and at the vendor stands all contribute to the light-filled atmosphere of the classic fair. On the second floor of the gallery there are works from Andre Benoit, an abstract assemblist sculptor from Boothbay Harbor, who creates fanciful animal forms and iconic motifs with repurposed, painted and assembled wooden remnants. 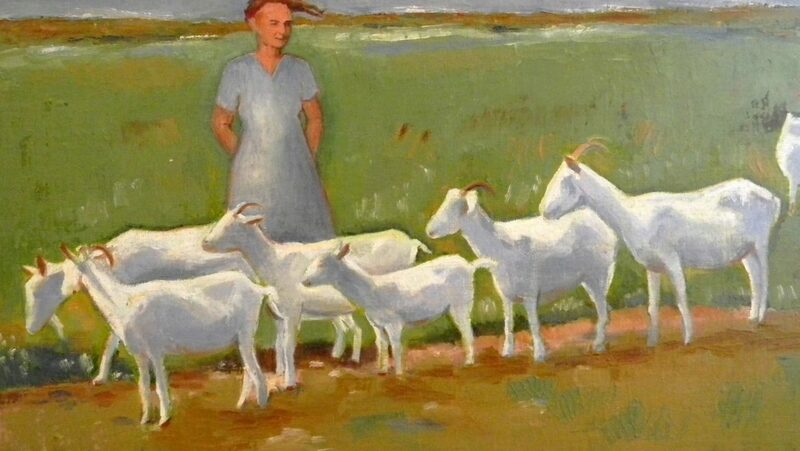 Frances Hynes, a New York artist with many ties to Maine, will display her lyrical watercolors, depicting simplistic farm landscapes with gamboling cows and paddling ducks. 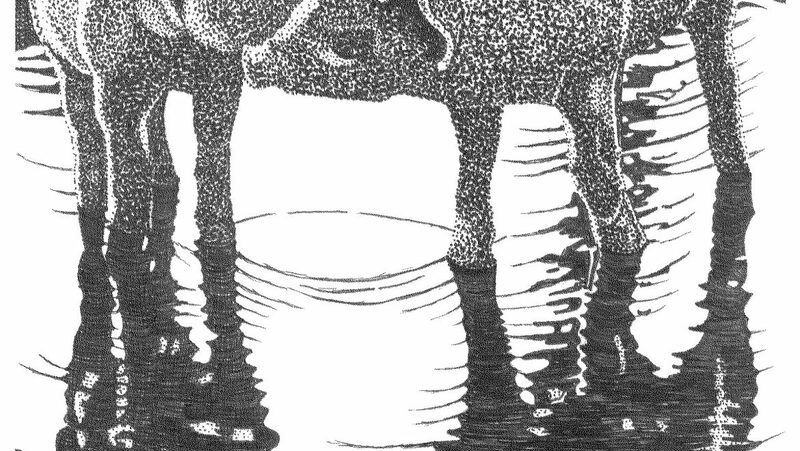 Rounding out the artists in the show, both from Belfast, are Leslie Moore, with work including a stippled pen and ink drawing of pigs playing in a puddle, and Julie Cyr, whose oil paintings of animals reflect her inspiration in the wonder of daily life and the light and shapes that arise from the simple scenes around her. I Went To the Animal Fair: Finding Common Ground runs from September 10th– November 2nd, with artist talks Friday September 28th at 5pm, followed by a reception and the town-wide Belfast Art Walk from 5:30-8pm. 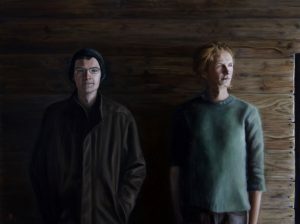 MF’s Gallery’s new show, I Went To the Animal Fair: Finding Common Ground, features Belfast artist Kerstin Engman’s oil paintings on the first floor, with works by Andre Benoit, Frances Hynes, Leslie Moore, and Julie Cyr on the second floor. For those who can’t make it to the gallery during 8am-4pm weekday hours, come by and see our Summer Stable show 5:30-8pm while we are open late for the Belfast Fourth Friday Art Walk. A multimedia exhibit exploring our collective and diverse relationship to home/land. 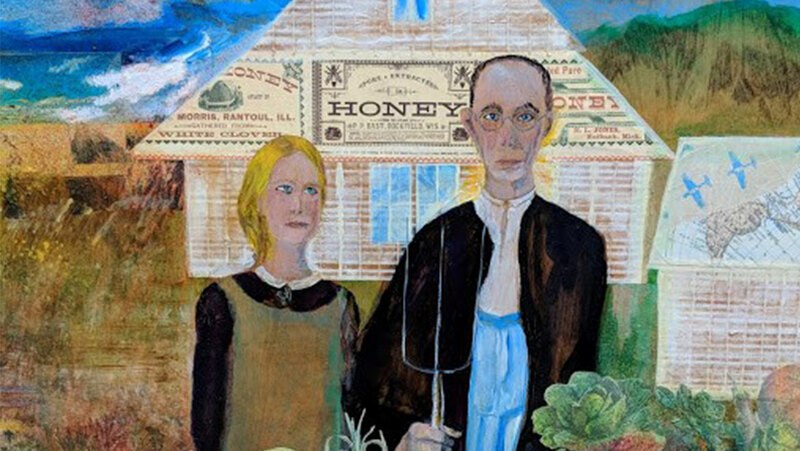 MFT Gallery invites farmers, artists, artisans and writers living in Maine, from diverse social-economic, ethnic and cultural backgrounds, to create art, craft or poetry which reflects on their unique relationship to home/land. We are particularly interested in works that speak to a deep relationship which comes from cultivating the land, or a longing for connection with the land. 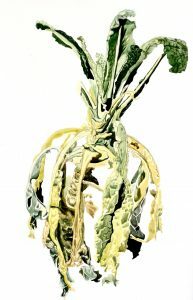 For example, we invite work by farmers/artists which expresses the relationship with the land they cultivate; we invite work by farmers/artists who have been separated from home/land in some way and are cultivating a new relationship to the land they are on; we invite work by those who are longing for a renewed relationship to home/land. 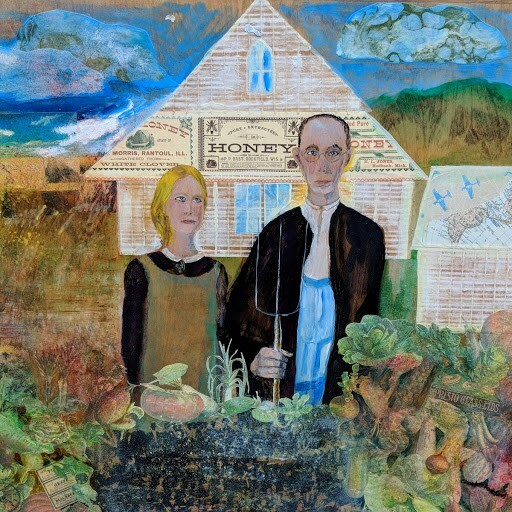 Maine Farmland Trust will host the exhibit at its Gallery in Belfast from November 12, 2018 through March 1, 2019. This exhibit is promoted and curated in collaboration with GEDAKINA and several other organizations. Depending on the number of participants, up to three pieces per artist/writer will be exhibited. If there are more submissions than gallery space, final selections will be made by a panel. The objective is to have all who submitted work included. By July 15, 2018: Contact Anna Witholt Abaldo, MFT Gallery Curator (anna@mainefarmlandtrust.org), phone 338-6575 X 112) to let us know your intent to participate, stating medium/type of work. By August 15, 2018: Submit up to 5 digital images of proposed work to Anna Witholt Abaldo (anna@mainefarmlandtrust.org). For each image, please include title, media, and dimensions. Photos can be of work in progress. Please add a brief artist statement/bio to accompany exhibited works. September 15, 2018: Notification to participants confirming how many pieces will be included. November 5-6, 2018: Works must be delivered to Maine Farmland Trust Gallery. November 5-9, 2018: Exhibit will be hung. November 12, 2018: Exhibit opens. November 16, 2018, from 5-7pm: Artist reception with artist talks by those who wish to speak about their work, at 5pm. There can be room for song and poetry reading as well. March 1, 2019: Exhibit comes down and works are available for pick-up. Early this April, a jury panel consisting of Stuart Kestenbaum, Susan Larsen and Ariel Hall awarded eight recipients with a 4-6 week residency at MFT’s Fiore Art Center at Rolling Acres Farm in Jefferson. In its third year, the Center received 66 applications for its summer arts residency program. The categories included visual arts, literary arts and performing arts. This year one residency placement was reserved for an indigenous artist and one for an international or out-of-state artist. Thu Vu, from Vietnam, was awarded the international visual arts residency. Vu first came to Maine from Hanoi Fine Arts College in 1998 as an exchange student; she attended Maine College of Art in Portland. 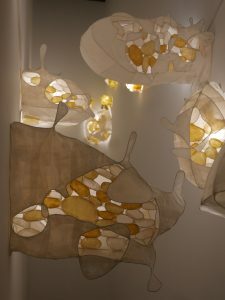 Vu creates light sculptures made out of paper and natural materials. Her work has been exhibited throughout Asia, Europe and the USA. Clif Travers grew up in the mountains near Sugarloaf. One of his current bodies of work, The Medicine Cabinets, grew from three years of interviews with people around the country. Travers asked each person: “What would you consider to be a social malady that could be easily cured by regular folk?” The resulting “cabinets” are all connected to nature and show the malady, as well as the imagined cure. 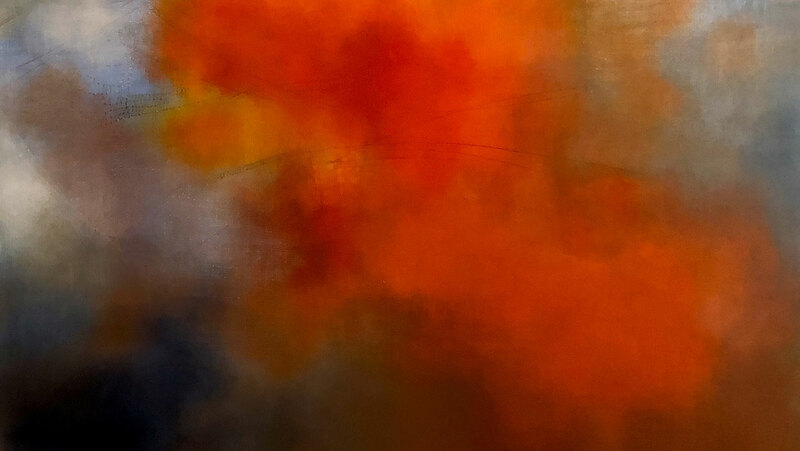 Michel Droge: Droge is an abstract painter—her work reflects a poetic connection to the land, climate change research and the philosophy of the sublime. Estefani Mercedes: Mercedes is an activist artist with deep connections to Maine. She is interested in local Brooksville archives that connect to the Argentine dictatorship. 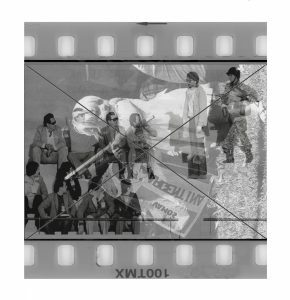 Through radical justice, film photography and copyright law, she hopes to restore missing violent histories and silenced voices by building publicly accessible archives. 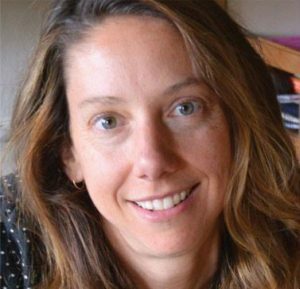 The Fiore Art Center’s literary arts residency was awarded to Maine writer, Jodi Paloni. 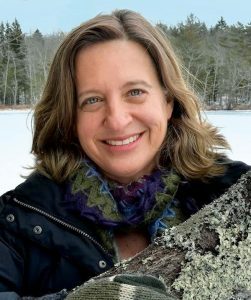 Paloni is currently working on her second book, a novel-in-stories, which takes place in the sixties and seventies on a farm similar to the Center’s Rolling Acres Farm, and tracks three Maine women from their girlhood to contemporary midlife. View “MILK” by Heather Lyon here. Each year, the Center hires a seasonal resident gardener, who lives on the farm for five months and grows food for the residents. “We’ve been lucky to find gardeners who also have their own creative practice, and enjoy being immersed in our residency program setting,” says Anna Witholt Abaldo, co-director of the Fiore Art Center. This year’s gardener will be Rachel Alexandrou, from Alna. Her organic gardening experience spans a decade, and she is currently completing her bachelor’s degree in sustainable horticulture at UMaine, Orono, with a minor in studio art. Those interested can find more information on application details, summer visitor hours and open studio dates here. The mission of the Joseph A. Fiore Art Center at Rolling Acres Farm is to actively connect the creative worlds of farming and art making. The Center’s purpose is to continue and evolve the dialogue between human and environment within the context of our current culture and time. The Center offers exhibitions and public educational events, engages in research and development of new farming practices and hosts residencies for artists on a working farm in Jefferson, Maine. 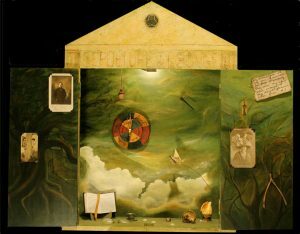 The Fiore Art Center is a program of MFT. The late Joseph Fiore was an artist and active environmentalist who, with his wife Mary, generously supported MFT for many years.